Cells need to react to environmental changes and maintain a balanced system of signaling cascades within the cell. Proteins outside of the cell, on the cellular surface, inside the cellular membrane, and within the cell orchestrate many fine-tuned signaling pathways, which result in reactions to environmental conditions or changes in the organism itself. The spatio-temporal organization of cellular processes like cell signaling, cell polarization and neurite outgrowth are often regulated by the subcellular distribution of molecules or organelles. Individual proteins can perform distinct functions when located at different subcellular locations. One example is Rac1 protein, which controls the shape of the skeleton of the cell at the intracellular plasma membrane, but when it localizes in the nucleus, it regulates nuclear morphology. The nucleocytoplasmic shuttling of Rac1 plays an important role in tumor invasion. In neurons, the bidirectional transport along axonal microtubules plays a critical role in the proper subcellular distribution of organelles. Its misregulation is involved in neurodegenerative diseases. However, the analysis of complex processes that involve cycling, trafficking or shuttling of signal molecules/organelles between cell compartments remains a major challenge. The group of Yaowen Wu, professor at the department of Chemistry at Umeå University, has now developed a new technology termed Multi-directional Activity Control (MAC), which makes live studies of cell signaling processes possible. The researchers are pioneers in developing methods for real-time observation of cellular mechanisms under controlled conditions. They used a photoactivatable, dual-chemically induced dimerization (pdCID) system to control the positioning of organelles and proteins at multiple locations in a single cell. This system combines two chemical reactions that form protein dimers in a single cell. One of them could be controlled by light. 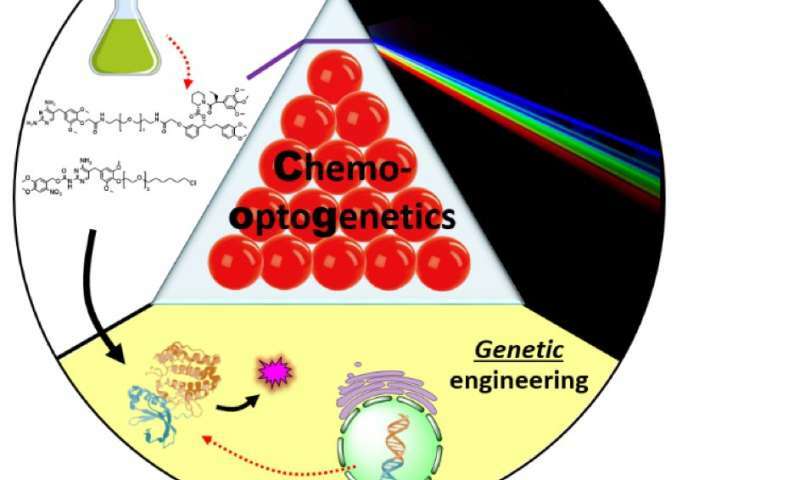 "We showed that our photoactivatable and chemically induced dimerization system could be used to control the function of cellular organelles and cellular signalling pathways in a single cell on a fine-tuned and multilayer level, which was not possible with existing methods before. We combined two modular systems in a parallel or competitive manner to enable multi-directional control over protein or organelle activity by small molecules and light," says Yaowen Wu, who is just setting up his new lab in nothern Sweden. The research group also demonstrated that the new technology enables very rapid induction and observations of different cellular reactions, and enables new perturbation studies that were not possible using traditional genetic approaches. Using this method, the scientists operated multiple cycles of Rac1 shuttling among the cytosol, plasma membrane and nucleus in a single cell. They could control the transport of peroxisomes (a cellular organelle involved in oxidization of molecules) in two directions, i.e. to the cell periphery and then to the cell body, and vice versa. This is like playing a game of pool in the cell, but at micrometer scale. The MAC approach could also be used to emulate or interfere with disease conditions involving protein/organelle positioning in order to study pathogenic mechanisms, and ultimately aid the development of their therapeutic intervention. The study is published in Angewandte Chemie.